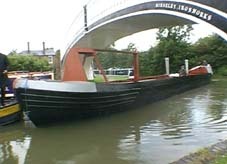 Raymond was rebuilt at Tardebigge, using whatever could be salvaged from the old boat. 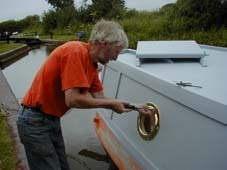 Phil Babb, ably assisted by Richard Clapham, started the restoration work in the autumn of 1999. The opepe bottom boards were soon in position; these are held together by the kelson, also of opepe. The oak stern-post can be seen in the bottom right of the picture. Once all the bottom boards had been secured, the cast iron knees were fixed in place. 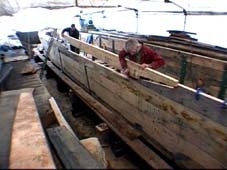 This is the third time they have been used; they were recovered from a previous boat when Raymond was originally built.The oak planks need to be bent to form the shape of the bow (and stern). 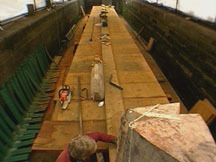 After being steamed for 2 hours a plank is quickly put into position and held by clamps until it has cooled.The dry-dock becomes fog-bound! Each plank is then planed to fit exactly and then riveted to the bottom boards. 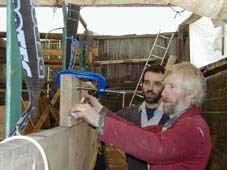 By mid-February the third row of planks were almost finished – just two more rows to go.Here we see Phil (right) and Richard marking out the scarf joint on a third-row plank, note the clamp holding the plank prior to final fixing. 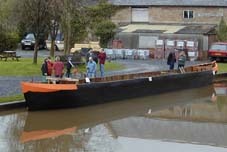 The last side plank is fitted into place (8th March) while three of the ‘fund-raisers’ admire the workmanship.There is still a lot of work to be done before the boat is fully restored. By 16th March nearly all the shearings (half-inch vertical timbers) had been nailed to the inside of the hull.Next week they planned to be caulking . . .
. . . and they were! 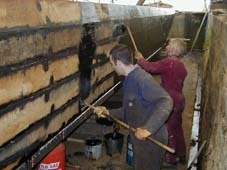 It’s the 23rd of March (2000) and the hull is getting near to completion. Just over a week’s work remains to be done before she can be launched.29th March and the first coat of pitch is going on. 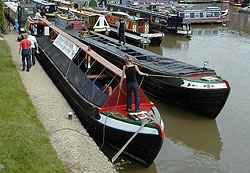 Raymond moored at Tardebigge soon after the very successful launch on Sunday 2 April. The white rectangles are notices warning people of the tacky tar. 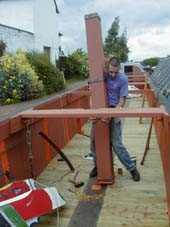 She will now have the foredeck and cabin built before being brought back to Braunston later in the summer. 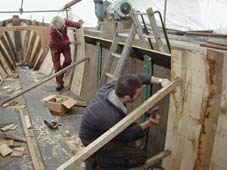 After 5 months of continuous work on Raymond, Phil Babb took a bit of time off to attend to other commitments.By early-May he was back on the job and by mid-May had done a lot of work on the gunwales and is seen here discussing progress with Alan Palmer while Richard constructs the cabin frames. Work on the cabin progresses . . .
. . . and work has also started on the foredecking. 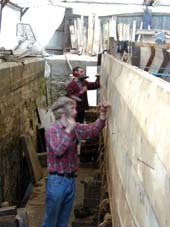 …while Richard (right below) makes and fits the shuts (floorboards). …while Phil (right below) fits the (only) port-hole. 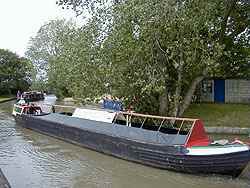 Triumphant return to BraunstonOn 3rd July 2000 the restored boat was towed back into Braunston Marina and moored just a few yards from where it had been built 42 years before. Delivered in primer, she still needs to be painted in the original livery. And now – reunited with NutfieldDuring her working life, Raymond was mainly towed by Roger. However, towards the end Nutfield took over. 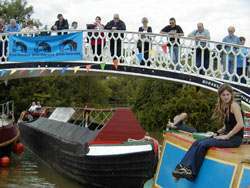 Nutfield is now back at Braunston too and during the Braunston Boat Gathering (on 22 July 2001) for the first time in over 30 years they were paired up again. … but better still to see them taking part in the boat parade!